Lucky Boyne City. It lies at the east end of beautiful Lake Charlevoix and is guarded on by scenic high hills. On the south side of town is Avalanche Peak, a nearly 1,000-foot high point that provides some of the most panoramic views in the Lower Peninsula. 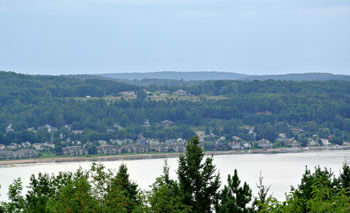 On the north side of Boyne City is The Hill. While not quite as high, The Hill still provides views of Lake Charlevoix and the ridges that make it such an incredible body of water and is accessed by a 2.5-mile trail system that, despite the preserve being relatively new, is well marked and easy to follow. Originally part of the Grunow Farm, the tract was purchased by the Herzog brothers — Gene and John — and their friend and fellow orthopedic surgeon, Dr. Lou Mrstik in 1966 after the men fell in love with Northern Michigan during ski trips to Boyne Mountain. Their families began a 50-year tradition of enjoying the high ridge during trips up north. In 1996, the families donated a conservation easement on 106 acres of the property adjacent to the vineyard and garden and in 2011 the land was donated to Little Traverse Conservancy to become a permanent nature preserve. In addition to its interesting topography including its 924 foot evaluation, The Hill features a nice diversity of both pines and hardwoods within its boundaries. Hikers will also encounter apple trees that grew from the seeds of the old farm orchard. 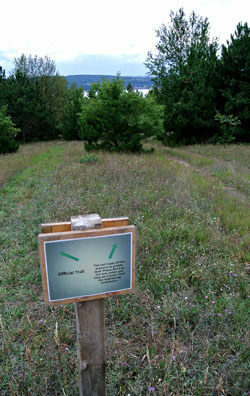 The trail system, a mix of old two-tracks, mowed lanes and new foot paths, basically forms a loop from the trailhead parking lot with two cross-over spurs. The perimeter of the system, the hike described below, is only a 2.3-mile outing and if followed in a clockwise direction saves the views of Lake Charlevoix as a highpoint towards the end. From the trailhead the loop begins as a gated two-track that climbs steadily uphill through the forest. All junctions are marked with locator maps and the second one is reached at Mile 0.4. 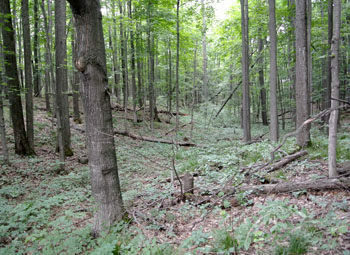 Head north (left) to continue along the perimeter of the system as the trail descends off the hill through a mix of woods and meadows and bottoms out the third junction. Head left again to climb back up the hill through a scenic stand of hardwoods and at Mile 1.2 you arrive at the fourth junction where four trails meet including the two-track you began. To the south (left) the trail is a long, narrow loop through open meadows and handful of apple trees to the best views of Lake Charlevoix reached at Mile 1.6. A lower elevation and pines that partially obscure the view, make this highpoint far less dramatic than the top of Avalanche Peak but it’s still a scenic spot. There are old two-tracks in the area but the route is clearly marked and leads up the hill and back into the woods. At Mile 1.75 you return to the original two-track and second junction. This time look for a foot path leading west (left) into the woods. This segment follows the edge of the hill and in late fall or winter there are glimpses of Lake Charlevoix through the trees. The rest of the year you’re peering down into a scenic wooded ravine. You reach the first junction on the two-track with a third of a mile and then head west (left) to return to the trailhead at Mile 2.3. There is no toilet or drinking water at the trailhead and currently parking for only three or four cars at the most. The Conservancy is working with the Charlevoix County officials to find better options for parking along Old Horton Bay Road. 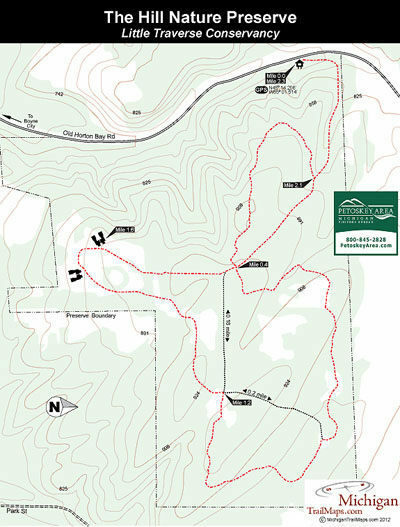 There are no vehicle or entry fees to hike or snowshoe at The Hill Nature Preserve. From Boyne City head north from Main Street on N. Lake Street which eventually becomes Boyne City-Charlevoix Road as it wraps around the lake. Before you pass the entrance to Young State Park, turn right on Charlevoix Road which quickly becomes Old Horton Bay Road. Within 0.7 mile from Lake Street you see the preserve sign marking the trailhead on the east side of the road.